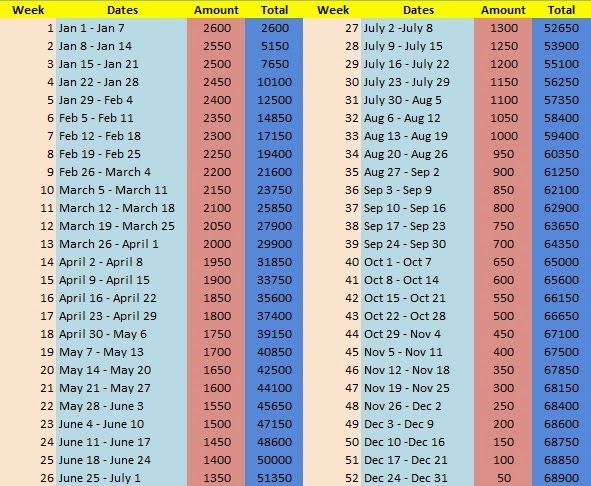 What better way to welcome 2015 by doing the 52 Weeks Money Challenge. If you are still looking for a New Year’s Resolution or two, perhaps you could include this new saving habit. Trust me, I’ve done this as well as countless others who emerged successful and flawlessly completed the challenge. 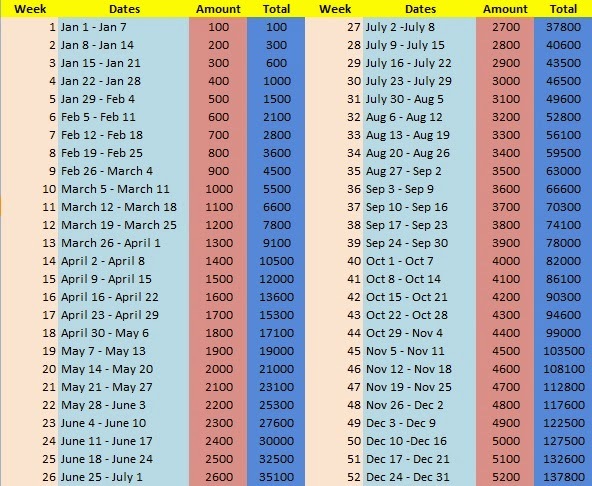 More than getting the desired amount by the end of 52 weeks, you are guaranteed to be able to come up with the habit of savings. And that is far more important because you get to value your money more. 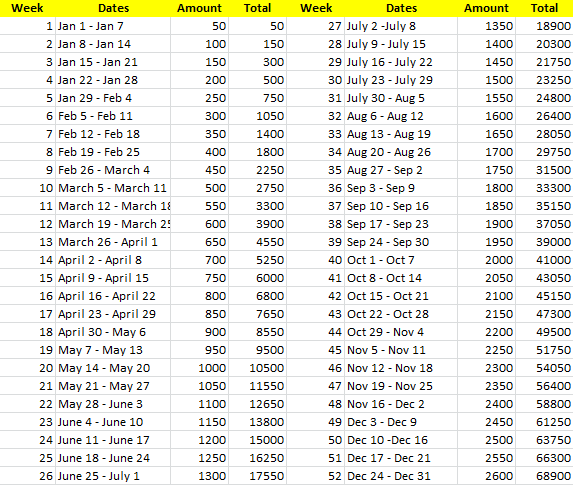 I have also attached the template that you can work around in case the increments of your choice is not present. You can play around with the template and adjust the amounts. You can alter the amount cells and the total cell will just update every single time you enter a different amount. With this template, you can be able to adjust the initial amount and also the incrementing amount. The total cell is derived from the entered amount and the previous total, hence it will add up accordingly. In this state, you will only bother with the amounts so that you will have an idea in mind as to how much you would be able to save up after 52 weeks. You can also make use of this template for your own personal money challenge. The amount need not increment as the weeks progress. You may opt to have an exact amount every single time. The important thing is you can be able to save and set aside a specific amount each week. To know more about the 52 Weeks Money Challenge, I have compiled the necessary information you need to know and transformed it in an ebook. You can purchase the ebook here. It is relatively cheap and also informative. It will most definitely help you every single inch in doing the challenge. P.P.S To those doing the 52 Week Money Challenge, it is Week 1 already! Did you deposit the next amount yet?